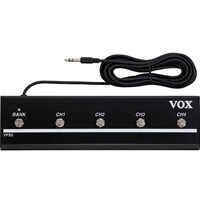 Control your tone on stage or in the studio with the VFS5 foot controller which works with any Vox VT series amp. Use this rugged 4-button footswitch to turn reverb and effects on and off, switch between presets, and even adust speed and tap settings with your foot. Vox VT modeling amps each pack an incredible array of amp tones and effects, and you can take advantage of their power and versatility by connecting a VFS5 foot controller!